Home » What is Khepri ? Khepri is a company whose goal is to manufacture insect-based products. Our company is targeting primarily populations in emerging countries living below the poverty level. It is based on an innovative and responsible business model in partnership with local populations to face the world food challenge. 25.000 people around the world are dying from starvation every day, and more than 2 billion people are suffering because of insufficient dietary minerals. 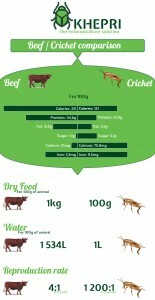 Insects account for 4/5 of the global animal mass and have a more interesting nutritional value than conventional foods. But taboos limit their consumption. Khepri wishes to make this resource more useful through a partnership with local communities. Our goal is to establish farms to breed crickets and thus develop businesses whose earnings will be maximized and shared. At the beginning the installations will be done in emerging countries. The word entomoculture designates the breeding of insects for industrial purposes, either for human or animal consumption, but also other applications such as the recycling of organic wastes or the production of biofuels. Tropical areas are naturally favorable for entomoculture, and the populations living in these areas are mostly culturally entomophagous, which gives a substantial competitive edge for the production of insects in these regions. Khepri will work with local producers, reaching in that sense the great political orientations of regional institutions. In fact, one of the first objective of the Agriculture Development Strategy 2011-2020 (program of the Lao government for the development of the agricultural sector) aims at ensuring a progressive transition from a survival production to a commercial production from small producers is to increase and modernize the production of agricultural goods by means of small producers organizations and private investment. 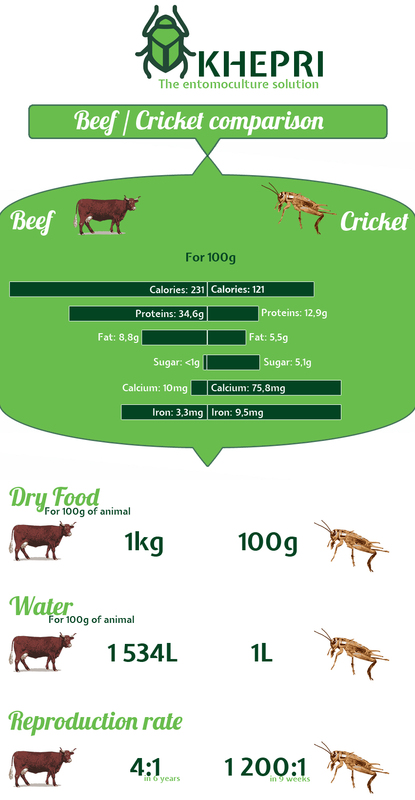 Cricket, although it is lower in proteins than beef, has more calcium and iron for fewer fats. Also, the breeding of cricket is far less demanding in food and water than beef, and thus has very low environmental footprint. Finally, crickets have a high and fast reproductive cycle and can be harvested every 6 weeks. The chitin extracted from crickets husk can be used in numerous domains: the cleaning of used waters, in agriculture for the coating of grains, for controlled salting out of products, as fertilizer, bio-fungicide, and protection against freeze, germination, flowering, and carpophore stimulator. It can also be used in bio plastics, as thermoforming film, as isolating foam but also in agribusiness as wrapping or disposable crockery. The chitosan extracted from cricket husks has specifications allowing it to be used in multiple cutting edge industries, for example in the cosmetic industry as a hydrating substance, an antibacterial, smell repellent or in hair treatments. Possibilities also reach the pharmaceutical industry, for hemostatic ends and anti-coagulant but also as a healing agent, for treating burns and epidermal wounds. Other possible applications are the creation of matrices for the regeneration of bone tissues and substitutes to cartilage, but also the transport and control administration of molecules, as well as the immobilization and encapsulation of enzymes and cells. The type of cage developed by Khepri has been conceived for warm and humid regions of Southeast Asia. It is ecological, ergonomic, rot-proof and easy to move during the rainy season. 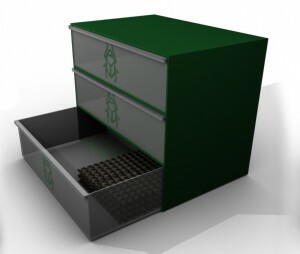 Furthermore, it has been conceived to maximise the production of insects by separating the generation with different drawers. This way, cannibalism between generations is limited. The cages will be made out of recycled plastic in a responsible way in order to respect sustainability rules. Khepri is based around a decentralized model putting the emphasis on entrepreneurship in emerging countries rural communities. First Khepri has to develop and build a model of breeding cage for insects destined for consumption. Within a kit, composed of several cages, an entomocultor can breed simultaneously multiple generations of insects and produce dozens of kilos per month. The farmer will then transfer part of his production to Khepri. The company will accompany the entomocultors from the beginning to the end of the production to ensure a good monitoring of the work being done: maintenance of cages, replacements, harvests, equipment. Khepri will transfer to the entomocultors the knowledge needed to breed crickets efficiently. In exchange of a certain number of cages, cricket eggs as starter and feed, the entomocultor commits to give us part of his production to Khepri. This way Khepri controls the production of its primary product and brings to entomocultors food security as well as an access to entrepreneurship in an innovative sector. The company is looking to setup a trustworthy relation with farmers in countries with a strong entomophagous culture. All of the insects collected are tested to ensure their quality before processing. Khepri’s partners then treat the batches of organic matter in order to separate the flesh of insects from their husk. The flesh is then transformed into flour to be used in animals feed. The shells are for their part dried in order to guarantee their conservation before chitin extraction. With the development of insect breeding, Khepri wants to offer to the food market the first structured supply of insect protein. Khepri has two target markets. The first one is the animal feed market: fish breeding, poultry farming and pig farming are the first industries targeted; in a second time we will also target pet food manufacturers. As for chitin, the main component of cricket husk, it will be sold to pharmaceutical industries, bio-plastic industries and high-grade medical companies. This high value biopolymer is used in cutting edge industries for its multiple characteristics.